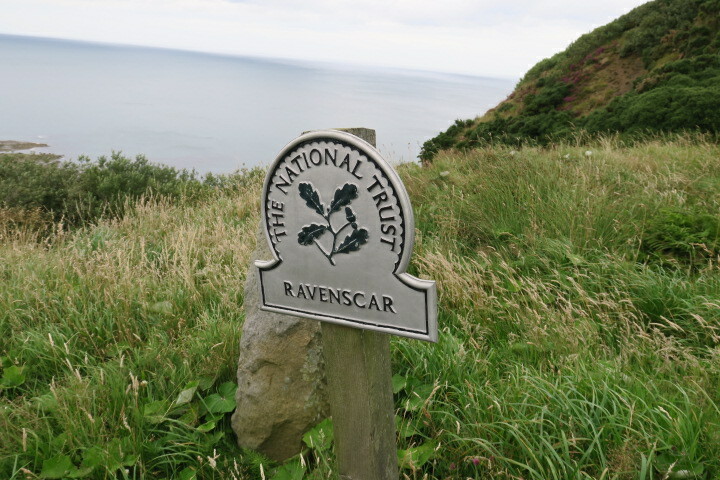 Browsing the touristy leaflets in our rental cottage, I came across an article about Ravenscar, a tiny place just beyond Whitby described as “the town that never was.” They had me at that, I wanted to go and see it for myself. Today it is no more than a hamlet set on spectacular cliffs. In Victorian times however it was earmarked for development and was to become a tourist resort to rival Whitby and Scarborough. Streets were planned and laid out but all came to a halt when the developer went bankrupt. A bit of interesting history plus some spectacular scenery and great hikes were what that leaflet promised, this sounded like our kind of thing. We found the old railway line, apparently this is where you can see the street layouts and parts of the unfinished village. It was mighty overgrown and we saw next to nothing – we tried! The National Trust visitor centre just a short distance away seemed like a good place to find more information. They had lots of leaflets on walks and hikes, we picked up one of these and set off. 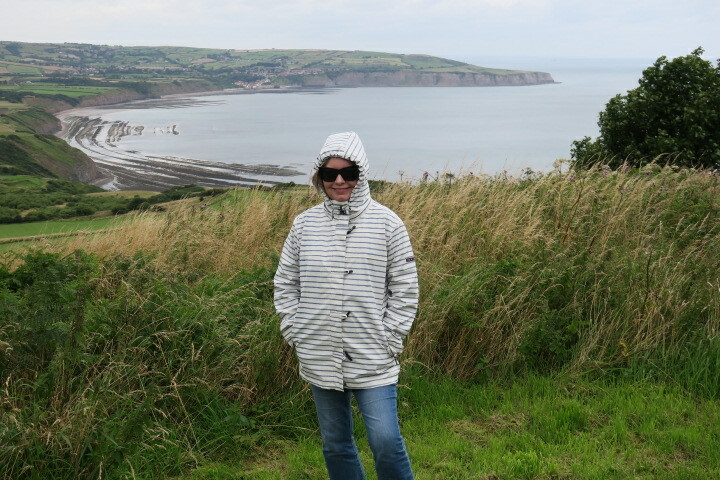 Blustery, cool and a bit damp, we were well wrapped up on this July day in Yorkshire and felt ready to face the elements. Our hike took us downhill and across a golf course to the cliffs. The views along the rugged and wild coastline are glorious. 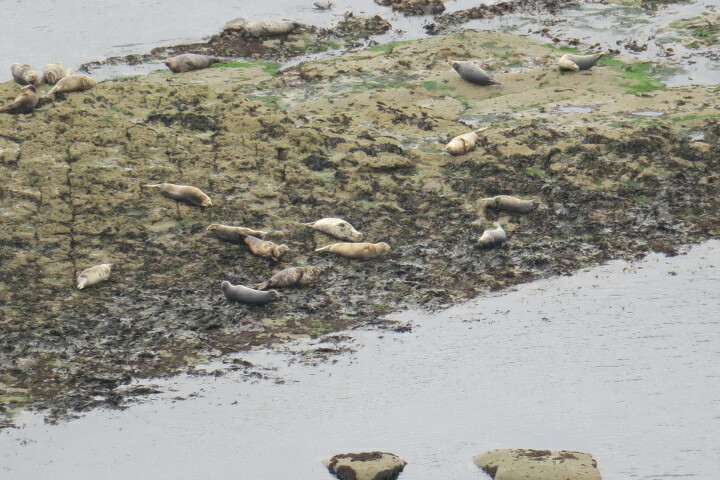 Down at the bottom of the cliffs is a colony of seals, they come here in June and July to pup and people can watch from a distance. We walked part way down, decided thanks to the incredibly steep slope that was enough. 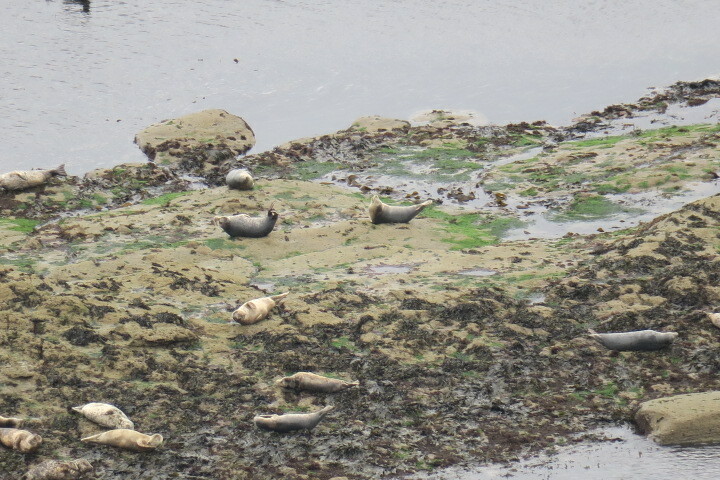 We spotted the seals on our camera zoom and could hear them quite plainly. 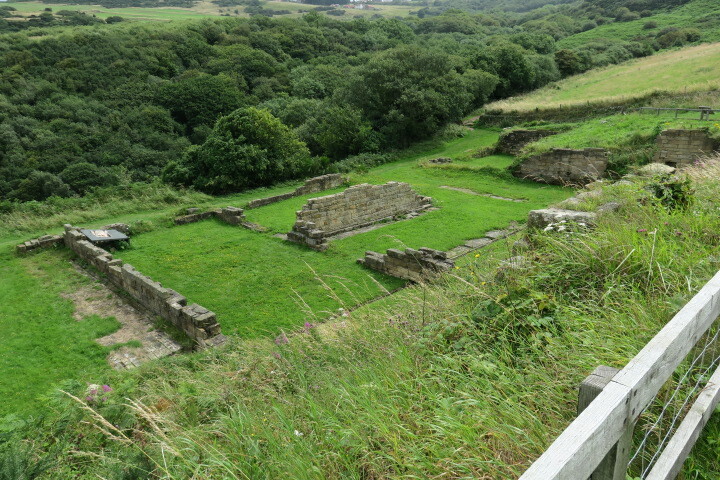 Our walk also took us past the ruins of the old Alum Works. There are lots of information boards about the manufacturing of alum which once happened here. Alum was used in the textile industry to help fix dyes and stop them washing out. They extracted it from rocks quarried from the hillside and turned them into alum. The production site here was in operation for over 200 years and once employed 150 men. Now just a jumble of old walls, some say this was the birthplace of the British Chemical Industry. All that downhill walking at the beginning was very pleasant but it came with one big drawback – from the alum works it was (steeply) uphill all the way. Hard going but with some pretty woodland we were pleased to arrive back at the National Trust cafe for a much anticipated cup of tea and an ice cream. It was – a hard hike but some lovely views. I can see it the photos, amazing trip! The weather in your pictures instantly reminds me why I like to go south to Europe for my holidays! Me too…. believe me I did mention this more than a few times to my long suffering husband!!! The reward was definitely the views and spotting and hearing the seals! That was a real highlight Pam for sure!! We got so excited about those seals. Nice walk but – July! Echoing Andrew, I’m glad I was elsewhere then. That’s the problem isn’t it with our glorious country – it is beautiful but you just can’t rely on the weather. We couldn’t believe how cold, wet and dreary it was several of our days in Yorkshire, July weather this most definitely was not. Cold never seems so bad in winter because you expect it. In July it’s a swizz! 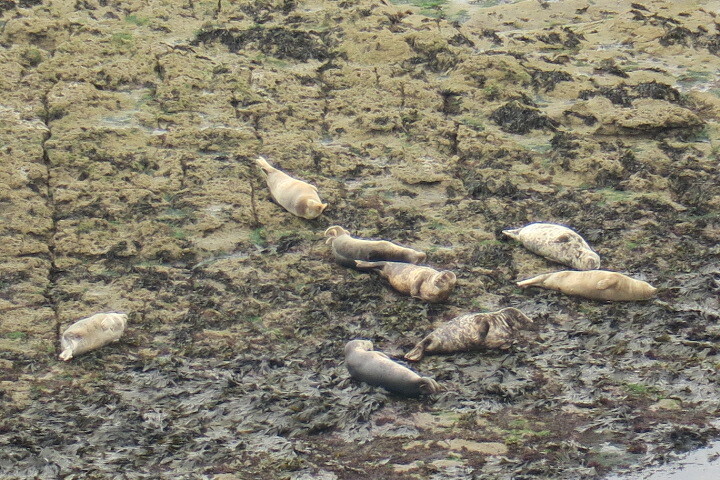 So nice that you spotted the seals on your cold, windswept walk. 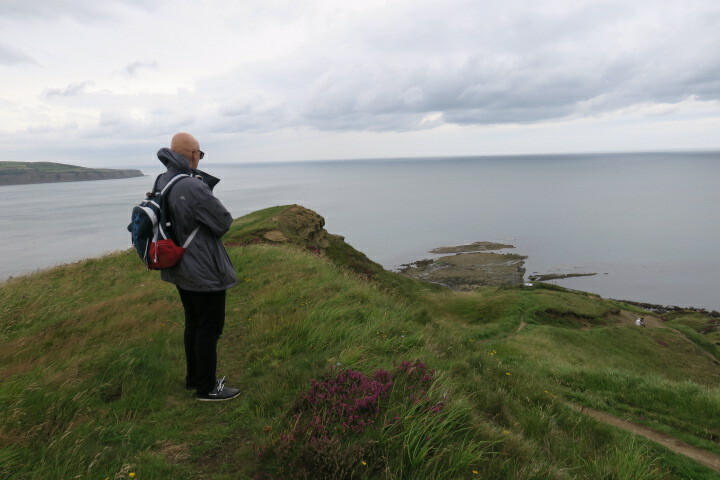 You seem to have found some gorgeous views over the cliffs but it’s so disappointing when it’s cold and wet in midsummer. You were brave having an ice cream, I think I would have wanted a hot chocolate and a toasted tea cake to warm me up Joy. 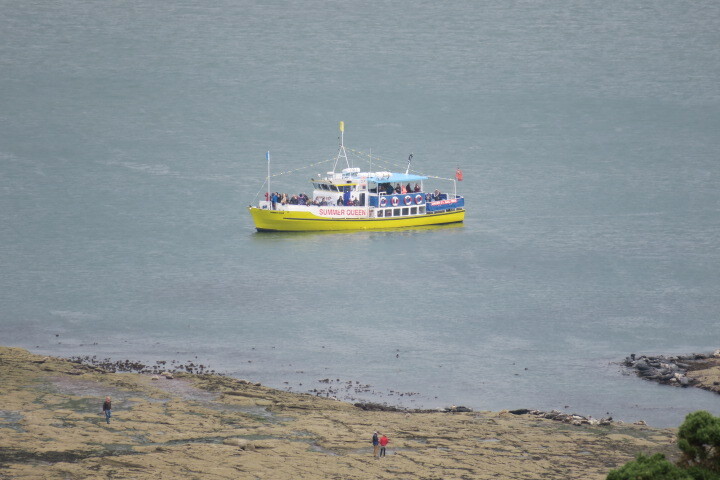 The seals were a real highlight Marion, I just didn’t fancy tackling that steep cliff walk in the wind and rain!! 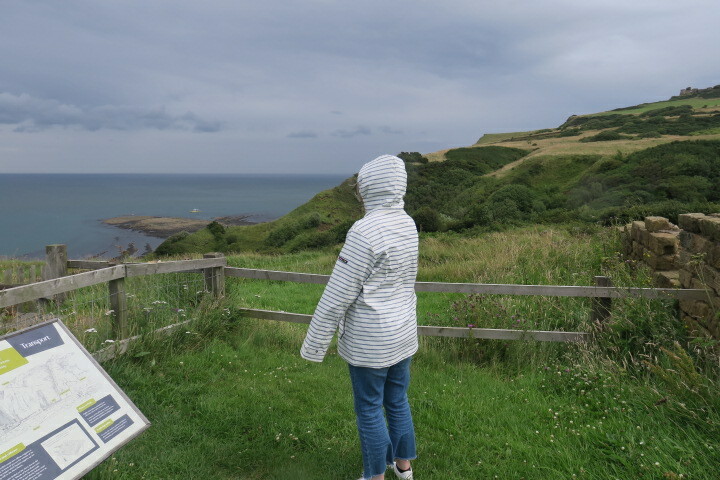 The weather was really disappointing – especially when we watched the forecast each evening and saw the rest of the UK enjoying lovely sunshine! What a nice addition to the hike to see the seals! That was the highlight of the walk for me – so great to see them! Damp it may be, the views are awesome! And I bet with the hike, the cold weather wasn’t too bad. I’d rather hike when it’s cooler than the blistering heat we get here in Texas!!! I am pretty useless in lots of heat – I just wilt and fade so although I didn’t really love the rain here it meant I was more up for a longer and harder hike. In your Texas heat I would just have to be under a tree sipping water!! It is definitely worth doing – the views are gorgeous and if you get to spot the seals it is an added bonus! My legs were jelly like after all that uphill climbing Reggie but spotting seals and seeing the wonderful coastline made up for the dismal weather. That cup of tea was very welcome!! It was hard going climbing all the way back up again but I’m glad we did it – the views were stunning. 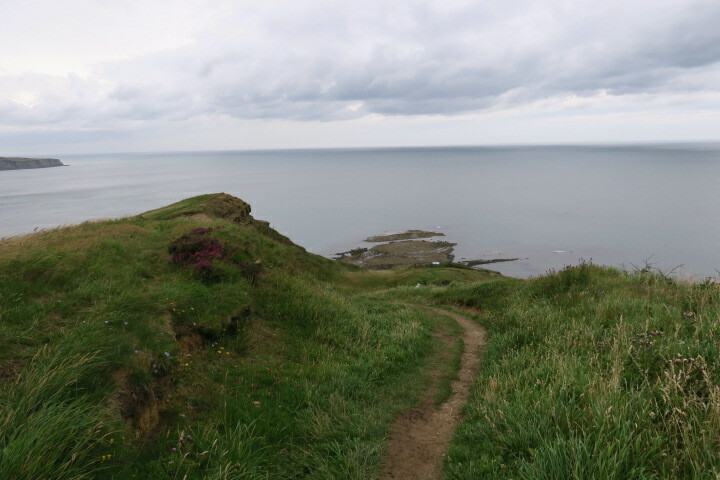 Despite the dreadful weather it was a lovely walk Rosemary, the Yorkshire coastline is so beautiful in sun or rain (thankfully for this trip!). 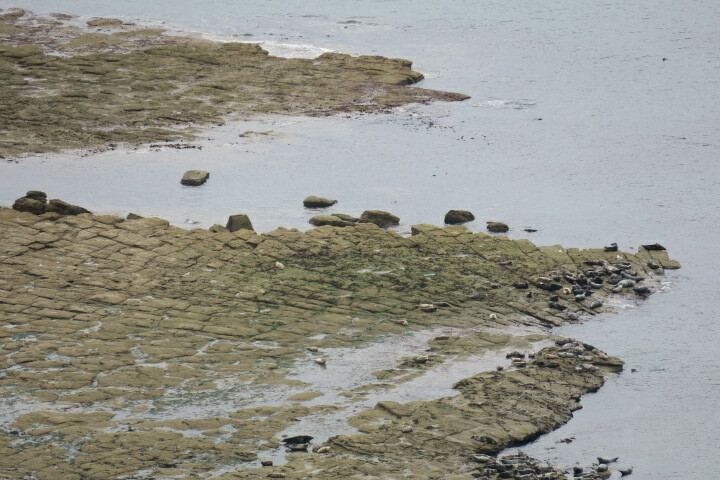 It was a real highlight to spot the seals – I loved that. Glad you got back safely, it must have been especially sad and difficult leaving England this time. Yes it’s always hard leaving at the best of times Joy but my dad is hopefully coming out here in the New Year and Mlle is coming over for Christmas so much to look forward to. The Yorkshire coastline is always spectacular whatever the weather fortunately! Never seen such an abundance of seals before. We got a great view from the top of the cliff for sure. Those are always the best of views when getting to the top.